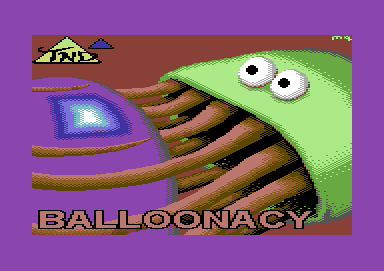 This piece of C64 history started it all. It was a simple disk/tape transfer program by DoSoft, which allowed you to transfer your games from your 1541 disk drive and then store it to a tape with a high speed fast loaded. I used to use this quite a lot when I was saving my own work from the disk drive and transferring it all to tape for my school friends and college mates to check out at the time. This program was released on a Megatronix public domain disk (Disk Utilities 1 I think it was). I did not really use this loader much, as it was just too much of a long process and was very awkward to master programs to tape, due to my clumsiness entering wrong parameters, etc. This turbo loader allowed you to load a program with a screen turned off with thin white stripes. First play music and then display a loading picture. The only disadvantage to this loader source was that it was bugged and programs that used this loader did not seem to work on CCS64. The boot took a while to load up due to the number of blocks. The only game I remember which was using this tape loader system on was Grid Zone. I showed an example of this game using the loader, but Cronosoft got back to me about the problems of getting thing on to tape, so I let them use Spectacular Copier. 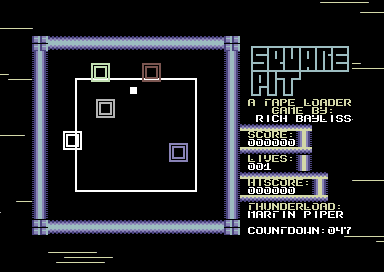 Sadly I don't have the .tap version of this game using Laze's loader, but if I still had it, I would have included it. This was a tape loader system, written by Paulie Hughes. And the fantastic fact about this loader was that it was originally used by Ocean Software. The author of this great loader had released the source code for the loader to Games that Weren't and eventually uploaded the source code on to his web site. The author made this source code as public domain and I was granted permission to use the loader source for various game projects of mine - Many of which were released FREE. The good thing about it was the nostalgic loading stripes and the ability to play loading music, etc. The drawback for me using this though was to split files to fit the loader's memory - and that sometimes failed. Thankfully Paul helped me out a few times, getting started with the loader. And I got there at the end. Freeload was used on a few of my old game projects, such as Cronosoft's release of Balloonacy and Balloonacy 2, as well as Grid Zone Remix. That was the way I remember it. 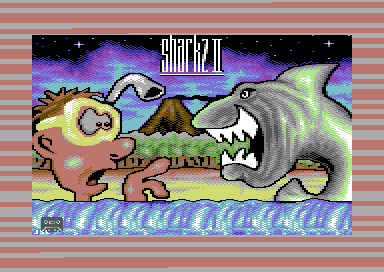 I also remember mastering Stranded by Kev Thacker, with his loading picture and I created the Cronosoft loader tune. When I first used Freeload, the tape loader used the standard Cyberload colour cycle bars. This version was used for Stranded and Sub Hunter and probably a few others. Eventually I modified Freeload to do cool stuff with my later releases, by adding some thin lines that changed colour while loading each block of data. Those two loaders were used in 2008-2009 for Sub Duel and Bomb Chase 2009. 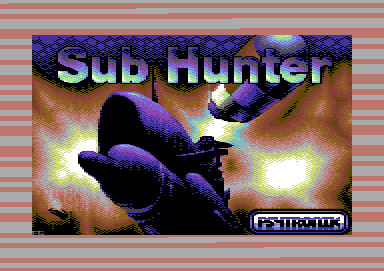 Good old Sub Hunter, using the standard loader. You might have noticed that recently I have been making .tap (Tape image) versions of my games and also some of Anthony Burns' latest games. Well, I thought I tell you a little more about this fab tape loader to you. I was playing around with the tape loader source by Martin Piper (Available from http://codebase64.org). I liked his loader source a lot, and I was given permission to change it and use it how I want. Martin's loader was just like any Cyber load or Freeload loader (The same cyberload colours). So I wanted to create a pretty original idea for a tape loader. Behold the Dance-A-Load. A strange and interesting little loader which uses the Martyload source, but code had been extended to give me the ability to place music at $1000-$2000, a loading picture from $2000-$3F40 and also after loading the game (Which is relocated to $4000) the loader will automatically relocate the game to $0801 and run the Exomizer or Martin's compression decrunch address (SYS 2061). First of all, the normal KERNAL loader will search for the program on tape. Once found, the screen will clear and display the filename in white text on the top left corner. After a few seconds (or after you pushed spacebar) loading will appear at the bottom of the screen and the screen is switched off. After the screen is switched off and loading. 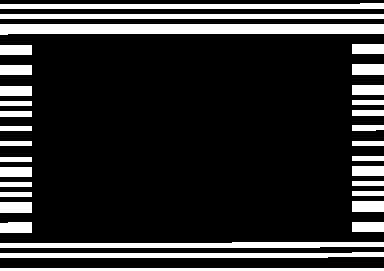 The first turbo CIA routine will display a plain black screen with black and white lines around it. Unlike the Martyload loader, this piece of code will not cycle through different colours. Just plain black + white stripes. 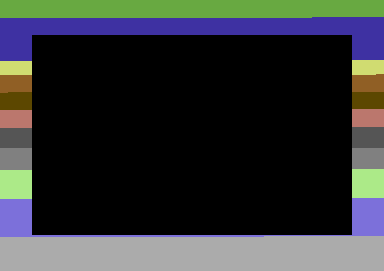 I used to use the plain black screen with nothing happening, but it would have made people thing that the program was not loading. After a few seconds after loading through the Turbo CIA routine, the loader will then activate another special loader, which is the Turbo IRQ CIA loader. The loader starts with a scrolling message in the middle of the screen with a nice colour shade amongst some of the characters. The loader then uses black border with thinner stripes. The stripes are some kind of indicator. 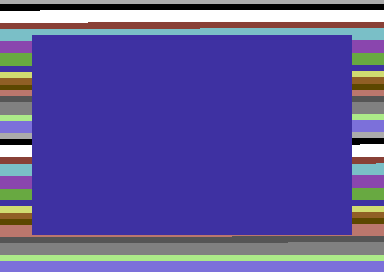 When the lines are active and are just one colour (or the screen is still black) the tape is searching for data to load. After the data has been found, the stripes will flash using the pulsating colour effect. If there is a load error detected. 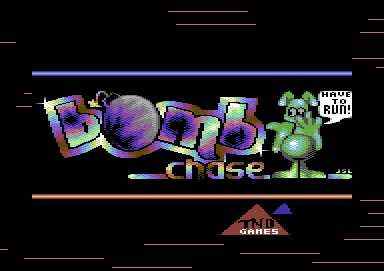 The border will constantly flash with multicolour, exactly the same way as the Martyload loader did. 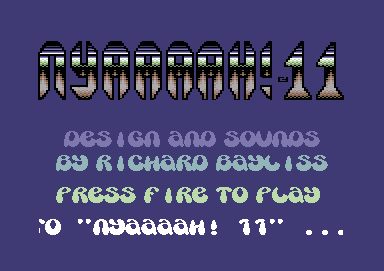 After a short while loading, The music (Dance-A-Load) will start to play in the background, although I can change the music whenever I feel like it - as long as it is not garage, hip hop or bassline (It is probably impossible to do that on a C64 anyway), lol. 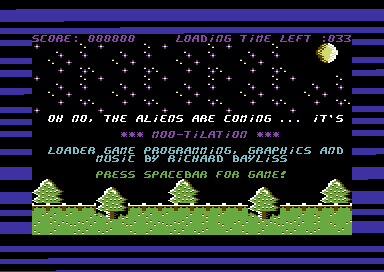 After loading music will come the TND Loader pic. (A picture converted using my own Vidcom2TNDPIC converter). When I was mastering The Wild Bunch for Psytronik Software. I was requested a loader that was based on the loader, which Firebird Software originally used, but add some music (The Journey) to it while loading. 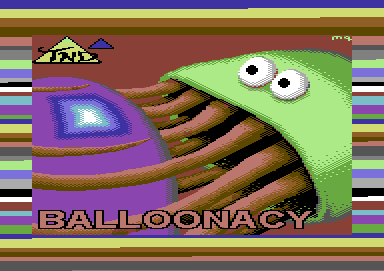 So I based the IRQ turbo source (by Martin) on that particular loader and tested it with Balloonacy. While I was still mucking around with Martin's tape loader source, I thought it would be interesting to do a loader lookalike based on the Bleep Load loader. So after editing the loader's code, I came up with this. I originally created the fake Bleepload loader for The Wild Bunch, but used Balloonacy for this experimental loader. Still yet another Firebird loader idea for The Wild Bunch game. I used the source yet again to make yet another classic blue loader by slowing down the turbo loader and draw the picture in the style of the original Firebird blue loader. 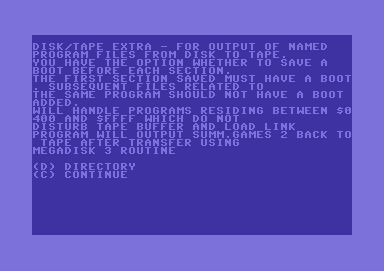 If you would like to master your games from disk to tape with this loader, you can download the tape mastering utility for the C64 from the link below. While I was playing around with Martin's tape loader source, I come across an idea which was to try and write a small loader game. Well, this loader did the trick. Inside the main IRQ interrupt some additional interrupts were executed making a loader game to work. 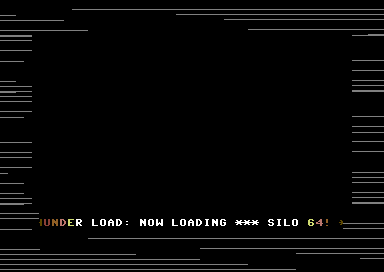 MooTilation was a loader game in which you had a tank at the bottom of the screen. And your mission was to save the cows from the alien ships. To do this, you had to shoot at the enemies that swooped along. The only trouble is that you didn't know which alien craft would go down and capture a cow. The game was fast paced as well. Once both cows were mutilated (or moo-tilated) the game was over. To get this loader to allow you to play the game longer, the baud rate of saving each file that uses this loader was slowed down to average speed (#$C0). To help the gamer see how much time there was left to load a program, I added a loader counter to it. This loader was first used on Mutilator. 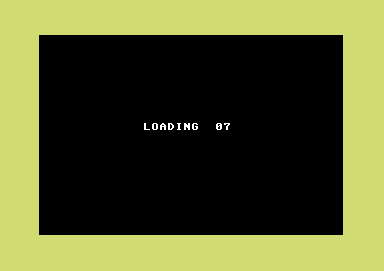 As well as display loading stripes, this loader made noise until after the game loader decrunched and the music kicked in. 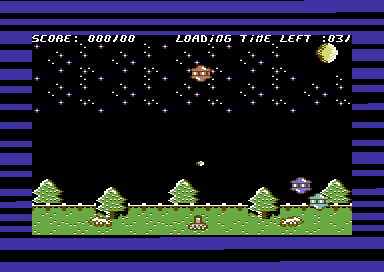 Above - Turbo boot loading and decrunching, second picture - loader's front end, bottom - game in action while loading main program future. 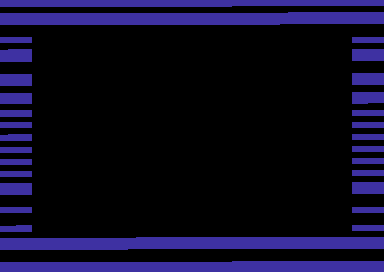 - Open Border loader (IRQ Loader using the open borders and only the side borders have the loading stripes). Another loader game was produced in 2011, which was used for a few contributor's games that had now loading picture. The loader was of course Happy Blocks. So what is Happy Blocks? Happy Blocks is a Public Domain loader game based on a PC flash game I played on FaceBook called "Block Dodge". The player is placed at the bottom of the screen and has to dodge the blocks which start coming towards you at a set speed. The longer you survive playing the loader game, the blocks start moving down faster, until the maximum speed has been reached. No lives were invoved in this game. You just had to keep playing, until a program loaded. Most versions of the Happy Blocks tape loader uses a bacl border with thin loading stripes. Sometimes I changed the loader scheme just for fun. 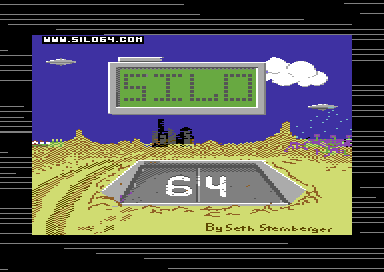 Rumour has it that people found this loader game to be one of my best loader games for the C64 :) How strange was that? To mark the new year of 2012. I launched Tape Master Pro V2.0. A tape mastering tool, which masters a game to tape with an IRQ loader, that displays a short scroll text, then draw a picture to the screen (like an Ocean Loader) as well as play music. TMP V2 had a series of additional options. Some of which included selecting the tape turbo speed of the tape loader. The concept of the tape loader system was literally the same as the first TMP, but instead, the loader had extra features. A load error detection, which worked similar to Super Pavloda (If load error found, border goes red, rewind a bit then play again). I did leave a couple of mistakes, which were fixed in May 2012 with TMP V2.1. Scroll text speed could be altered. 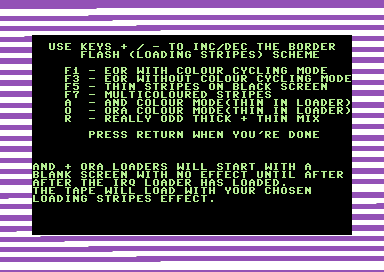 There was even a huge choice of the loading colour schemes, including the AND / ORA flashy border mode (Inspired by the Cruncher AB decrunch effect choice). Loading noise was disabled and scroll text lies at the bottom of the screen. 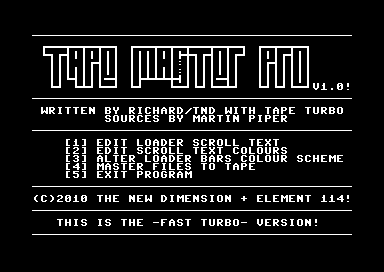 Tape Master Pro V2.1 was more recommended compared to V2.0, because of I made a bad header in the boot loader (where the black border + background should have been included). 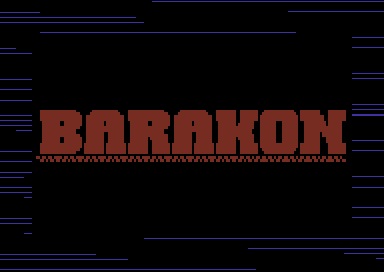 The bad header displayed an illegal char on screen (See Ron Rong's Pong Tape Version for example). The loader still worked fine. V2.1 repaired the bug and made one or two minor improvements. Near to the end of 2012, I created a new loader system, using "Tapetool Build" by Martin Piper. The IRQ tape loader was modified and I ended up with something completely different. A huge scroll text with one of my own charsets. Music and also scrolling sprites. The loader even had a tape counter. 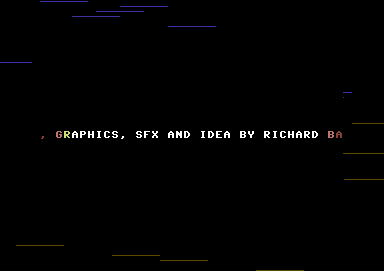 The scroll text in the loader was mainly to tell you about the game itself or advertise anything new C64 related by RGCD or Psytronik Software, etc. In March 2013, the tape loader was given a new addition in which Spacebar can be pressed to decrunch the game - so the tape loader can continue playing the music or scrolling the text message. Now and then I alter the tape loader stripes scheme. Most versions use either a black/blue loading stripes scheme or the black border with cycling thin stripes. This was originally made for my own personal use to build a .tap of some of the full single file games that were released on to the internet. Eventually it got used on all entry submissions for the SEUCK Compo 2013. Mainly because I didn't wish to play around with typing too much scroll text for the SEUCK compo on the Series Six loader. This loader system was inspired by the Commodore Format loader. Yep, Rasterload. This loader uses a clock at the bottom left of the screen. Unlike Rasterload, this tape loader consists of thin loading stripes, and flashing ':' between the numbers. 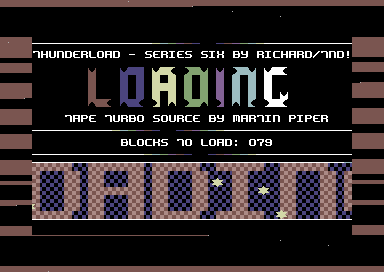 This loader is mainly built for any programs that are TOO BIG to fit the other loaders I adapted from Martin Piper's turbo tape source. I wanna make a loader. What shall I use?